Sometimes you just need something crunch and a little salty for a snack. I have found a great solution. It is VERY healthy, yummy to eat and totally satisfying. The best part is the whole family loves them. I have even served them when guests have come over for dinner. The only thing you have to be aware of is that pieces of the kale can stick to your teeth so you need to promise to do a "teeth check" after you have finished your chips! With a knife or kitchen shears carefully remove the leaves from the thick stems and tear into chip-sized pieces. Wash and thoroughly dry kale with a salad spinner. 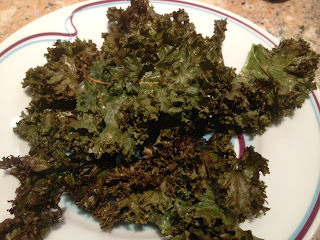 Spray kale with olive oil cooking spray and sprinkle with sea salt. Serve in a basket. One cup of kale chips is about 36 calories. This is a great snack or appetizer. It is a make-a-head recipe which is good to have on hand for holiday weekends. Enjoy & Live Vibrant!